This is the 2017 version of the kitchen. It fits into about 8’ x 10’ of my open floor plan. 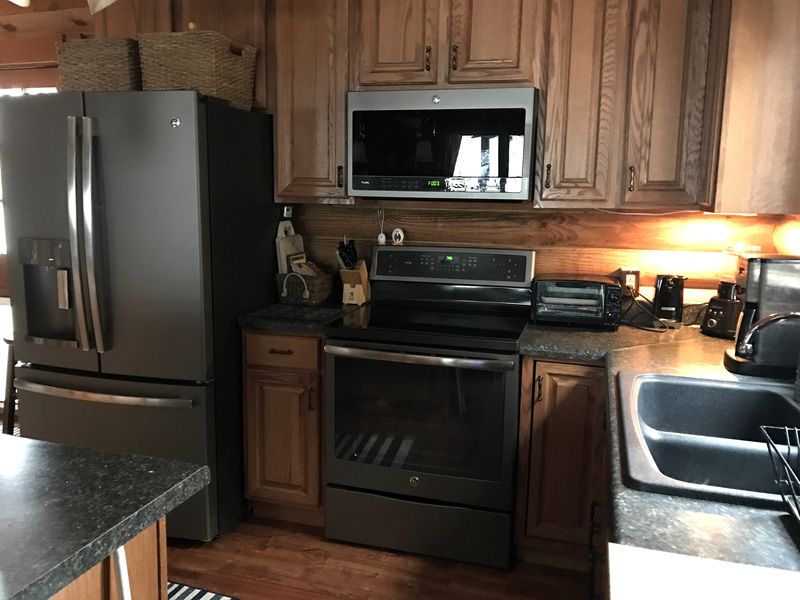 There is 42” of walk space from the front of the fridge to the facing cabinets. This is plenty of room to open the fridge, freezer drawer and dishwasher and for two people to walk past each other. The power for the stove was on the back wall. I have 10’ from the wall to the door. 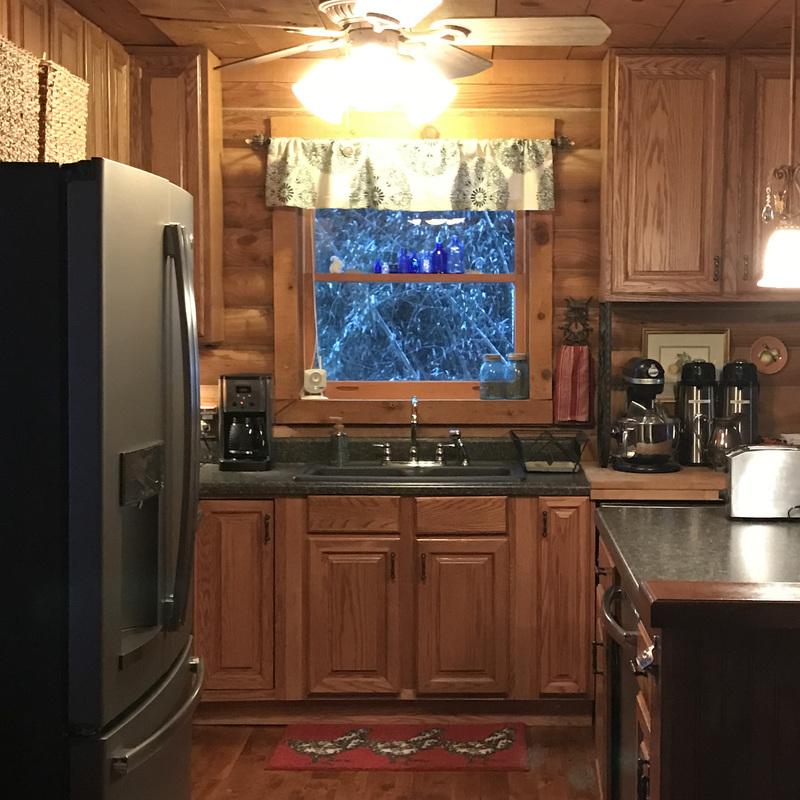 By using the smallest 36″ corner cabinet and a 15″ standard base, I was able to fit the stove and fridge and still give some storage and workspace. 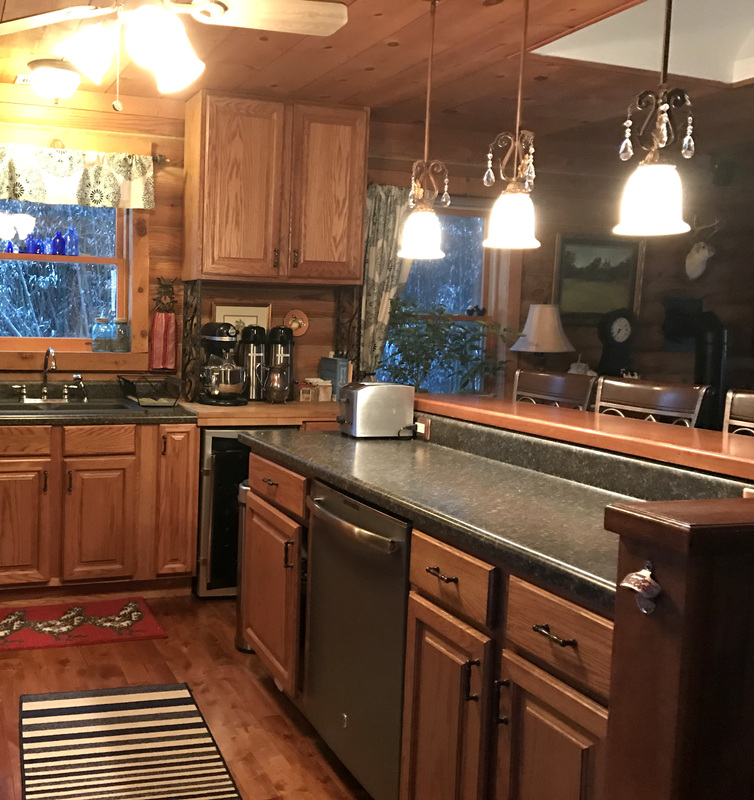 The corner cabinet has a lazy-susan in it. I wanted the sink to be centered under the window. I wanted the window centered between the cabinets. The sink base is 30″, which is narrower than the sink, but the installer was able to cut the sides of the cabinet to make it fit. Beside that is a tall narrow cabinet that is just perfect for baking pans. By going all the way to the ceiling, I got as much storage as possible. We put the dishwasher in the island. This is really not as convenient. You end up dripping all over the floor going from sink to dishwasher. I love the island. I feel like I have my own cooking show. I had previously run into difficulty in my office. The log walls lean. So things don’t really push back the way you might expect. My son-in-law and cabinet installer, Beau Houde, was able to measure and cut out to make everything look like it fits snugly. When you choose your refrigerator, decide how you use it. They list the cubic inches on-line. I wanted more freezer space, so this model was ideal. I decided not to use a deeper cabinet above the fridge. I think this looks better. It’s not convenient storage anyway.